You have got to try this Healthy 4 Ingredient Mocha Mousse! It only take s a few minutes to whip up! This would be the perfect dessert if you were short on time. It’s super rich and satisfying too! I got the recipe idea from a similar recipe I saw on Sugar Free Mom. Her recipe called for dairy, and this is my dairy free version. I think it came out really good. And really, who doesn’t like chocolate and coffee together? This healthy mousse recipe is vegan, gluten free and paleo approved. There is zero refined sugar. I topped mine with some dark chocolate chips, but that is totally optional. Hazelnuts would also be delicious. It’s great on it’s own as well. It would also make some pretty delicious frosting for cake or cupcakes! If you need a visual on how to make the coconut whip cream, here you go. 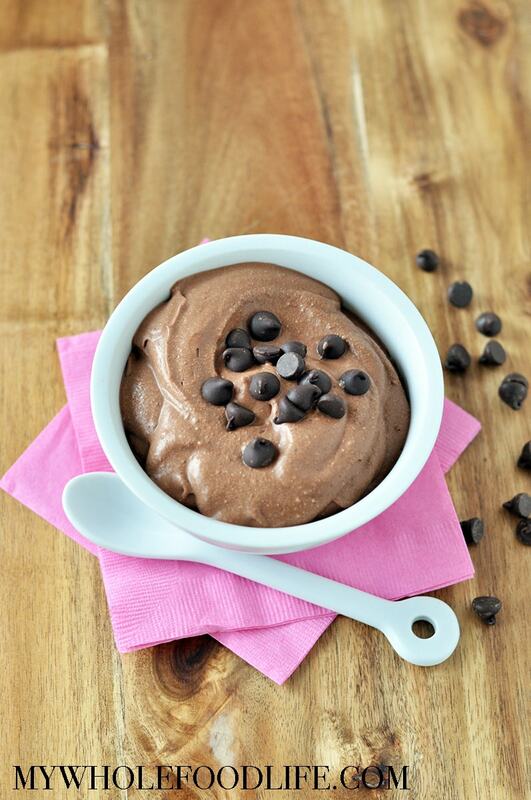 Just 4 simple ingredients to make this healthy mocha mousse! Open the can of coconut milk and scoop the fatty white part into a mixing bowl. You can save the leftover water for smoothies. Use the whipping attachment on your mixer and whip the coconut cream into a mousse. While it's whipping, add the remaining ingredients and whip until everything is combined. Spoon into serving bowls and place in the fridge until you are ready to serve. If you like, you can top with dark chocolate chips like I did in the picture. Enjoy! I tried this recipe and it came out ok. I needed to set aside the coconut milk "fat" to soften a bit - it was difficult to mix right out of the refrigerator. My hand mixer didn't get all the coconut clumps (after several minutes of mixing.) While eating this dessert I tasted pieces of the coconut. The smooth part was delicious. Next time I may try this in a stand mixer or food processor as my mixing didn't seem to cut it. Thanks for the recipe. Sorry it came out only ok for you. I always use my stand mixer and that blends everything up really well. wow fabulous and so easy. My new go to instead of coconut milk ice-cream @ $5.00-$7.00 a pint!